Unlike most people, lunch and breakfast is not when I really feel a need to eat desperately. The part of the day when I am ready to feast is after school. I know that sounds weird, but it is 100% true. (You can ask my mom). After school is when I like to have a big bowl of pasta, leftover chicken pot pie, or even a slice of pizza. The best after school snacks are by far when my mom has been testing a recipe during the day, and is using me as her little tester. She likes this testing system and so do I. 🙂 An example was a nice bowl of vanilla pudding sitting at the table waiting for me recently. I had never tried vanilla pudding before (trust me, I had DEFINITELY tried chocolate pudding and loved it) but it was soooooooooo good!!! It might have been even better than chocolate pudding if you can imagine. (!) I highly recommend this recipe, but there is only one catch. If you make a batch, eat it quickly because, trust me, if other people discover the pudding it will be gone in less than a second. That means you, Phoebe!! Based on a recipe my mom edited at Real Simple. Whisk together the sugar, cornstarch, and salt in a saucepan. Pour 1/4 cup of the milk into the sugar mixture, stirring to form a smooth paste. Whisk in the remaining milk and the egg yolks. Cook the pudding mixture over low heat, stirring with a wooden spoon until thickened, about 15 minutes. Do not allow it to boil. Remove from heat and stir in the butter and vanilla. Scrape the pudding into a bowl. Cover with plastic wrap, pressing the surface to make an airtight seal. Refrigerate until well chilled, about 1 hour, or less if your after-schooler is starving. 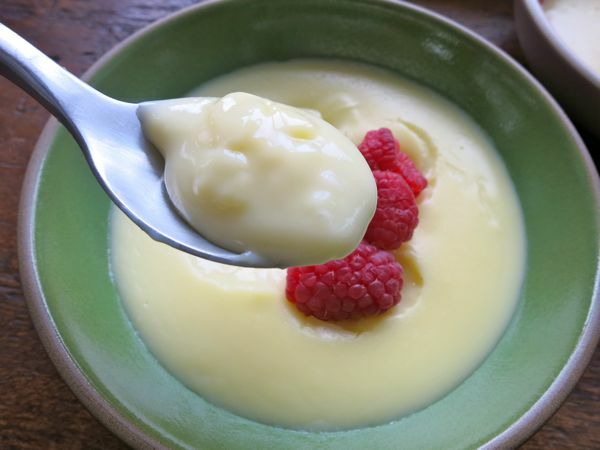 oh there is nothing like homemade pudding, thanks for sharing! and i agree abby, i am starving when i come home from work! it’s so hard to wait for dinner sometimes isn’t it? What a great post! Well done, Abby! I’m impressed. BTW, I don’t think it’s weird that you’re so hungry after school. I remember being the same way when I was growing up! I could eat pudding for and with every meal! Any flavor, any kind. Perhaps it’s not a bad thing for my waistline that my boys don’t like it in any iteration. A texture thing. Thanks for the reminder Abby– homemade pudding is easy, not terribly unhealthy, and can be dressed up or dressed down, as the after-schooler prefers. One thing to try: vanilla pudding with crumbled cinnamon graham crackers and a couple of crushed strawberries. Goodness, that’s good stuff! Thanks for the great post. When I was little, my Aunt Margaret always made a big pot of chocolate pudding and one of vanilla for special occasions. I love chocolate (and chocolate pudding, especially! ), but it is hard to choose which one is best. Kind of like Barb said, you can also make yourself an individual little banana cream pie by adding some crushed graham crackers and sliced bananas. Yum, my vanilla-loving child will be all over this (hope she shares with the rest of us)! I will have to keep the 2 egg yolks on the ingredient down low, but that is established policy here! Your vanilla pudding sounds yummy Abby. It will be perfect for an after school snack (I mean the dessert part) since we too eat full meals after school. I tell my kids it a sign that they really worked their brain hard in school that day! Yum!! This is my go-to quick after dinner dessert. I usually do a really simple version using vanilla and corn flour or custard powder and milk but I might start doing it this way instead. Thanks, Abby! The recipe sounds easy and delicious. Jenny and Andy, like they say,a apples do not fall far from the tree. How proud you must be of your kids! That looks wonderful, Abby! Nicely done. This recipe sounds delish! I couldn’t make it (our boys are all allergic to eggs), but it did motivate me to make a chocolate pudding for dessert last night. My boys all thank you! This is so sweet! And I love making home-made pudding, it beats the pants off the stuff at the grocery store. Abby- What a good writer you are! As a high school English teacher, I am very impressed by your skill–awesome job! My husband LOVES pudding, so maybe I’ll surprise him with this sweet treat. My 12 year old HATES milk, but loves pudding. We have a lot of pudding. (And I eat a lot of egg whites). She also boa constrictors her food in the second half of the day, starting in as soon as she walks in from school. Thanks for the recipe! Thanks for the recipe, Abby. I made some on Sunday and am tempted to make it again now that we’ve finished it all. I’m in South Africa where we’re just going into summer now, so we ate ours with fresh strawberries – delicious! This recipe seem easy enough for me to do it.